Pilar talks to Elise Keith, co-founder of Lucid Meetings. We talk about why “training how to run meetings” often fails and why you should take a holistic approach when trying to improve meetings in your organisation. 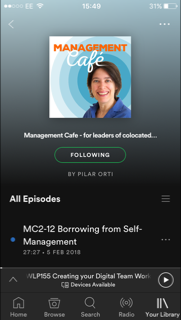 In this episode, Pilar talks to Elise Keith, co-founder of Lucid Meetings, a company providing a software product to help meeting leaders prepare and run their meetings, as well as offering consultancy/training on improving meetings in organisations. What does “scaling effective meeting habits” in an organisation refer to? Understanding what the purpose of each meeting is, what are you trying to achieve? There are lots of different types of meetings! Should we stop calling “meetings” meetings? Specially in the online space. “The perverse psychology of meetings”. When someone has a problem with a meeting, they rarely have a problem with a meeting. Why learning to run a meeting doesn’t mean you’ve learned how to guide a conversation. How and why Lucid Meetings was founded. We need a shift in perspective not “training on running meetings”. How Lucid Meetings’ is evolving, from helping them run better meetings, to helping then have better conversations. How the templates in the software support this. The software as the “bad guy”. The Effective Meetings Results Programme – a more holistic approach to improving meetings in organisations and why our approach to meetings NEEDS to be holistic. Newer PostManagement Café #11: Should we be "Authentic Leaders"?